Since 2004, the crew at All American Sweets has used engineering techniques – machines for precise batter distribution, an oven with a rotating rack and a kitchen designed for maxmum cake-icing efficiency – to make their super mosit cakes consistently delicious. All American sticks to southern staples like coconut, strawberry, caramel, red velvet and banana cakes. While all of the cakes are good, the strawberry cake makes me want to throw away my stand mixer and give up on ever baking anything that perfect. 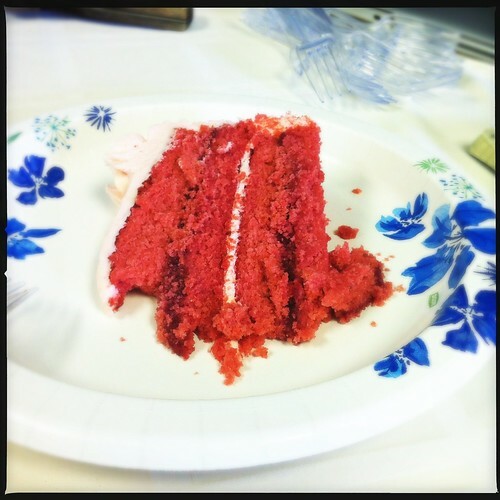 It's got four thin layers of cake glued together with pureed strawberries and homemade strawberry icing. Currently, All American Sweets sells slices of cake at Memphis restaurants and retailers, offers cakes for pick up at their Bartlett kitchen and makes elaborate custom speciality cakes. They have plans to open retail bakeries around the city sometime soon, though. You can pick up their cake by the slice at Soul Fish, Lucchesi's and Flemming's. It was a pleasure having you visit the bakery. Thank you! Oh, yes. I've tasted the strawberry, the caramel, and the coconut. Oh. My. Gosh. Out-of-this-world delicious! Bill your vacuum is ready to be picked up. I will be ordering a cake now that I know you are located right behind my store. See you soon.